When I was a young lad, my mates and me were out nearly every night checking out bands at pubs and venues all over South London. You could do it at that time, there were loads of places to play. The Golden Lion, The Castle, The Two Brewers, The Greyhound, the 101 Club, and many more. We were into bands, we were into bands in a big way. We played in bands, we watched bands, we loved bands and hated bands. Every one we knew played in bands. We made new friends. They came to see our bands, and we went to see theirs. I remember "The Escape Club", they went on to have a number one in the US with "Wild,Wild West". They were awesome. Most split up due to "personnel differences" only to form yet more bands or disappear to get a job and buy their council houses. And on it went. Every now and then word would spread of something new. Rumours abound of a band with an amazing guitar player who played with Kate Bush (always irresistible! ), playing at the Cricketers in the Oval. So off we went. This guitar players name was Alan Murphy, the band was SFX and 'bands' would never be the same again! Alan Murphy's talent was to put it mildly, jaw-dropping. It wasn't a speed thing, though Alan's technique was frightening. It was a combination of Alan's unique expression, a sound to die for, and an intangible extra quality that made his playing somehow greater than the sum of the parts. In every aspect of his playing and gear, he showed meticulous attention to detail. Be it a single note, a blistering run, or a shimmering chord, the end result was always compelling. Whenever you heard his playing, it was instantly recognisable. A tribute to his genius perhaps. This talent did not go unnoticed. By the time SFX hit the road he was already a first call session man. Apart from Miss Bush, Alan was called upon by Go West, Mike and the Mechanics, Level 42 and many others. If the name Alan Murphy is new to you check out Go West's "SOS" or Nick Heywards "Warning Sign". Ferocious improvised solos bursting with life and exuberance. The sad irony is that on 19 October 1989 Alan passed way. As a testament to the impression Alan left on the world, check out the messages board at www.almurphy.info , a most excellent site put together in Alan's memory. Even after his sad departure, there is a significant catalogue of material on which Alan performed that we can still appreciate and indeed learn from. Since his departure there has been a whole new generation of players weaned on Vai and Satriani. Though great players in their own rights, to my mind Alan's intelligent improvisational pop genius leaves them all standing. If the name "Alan Murphy" unfamiliar, check out any of the following. SFX was band of Alan's own creation. Featuring fellow luminaries of the session world, Felix Krish on bass, Tony Beard on drums and Richard Cottle on keyboards. The standard of musicianship was awe-inspiring. The band originated from the covers band "The Stapleton Allstars" (I remember a stunning interpretation of Larry Carltons "It was only yesterday") into SFX having created a set of all original fusionesque tunes. Undoubtedly, Alan used the band to experiment with sounds, writing and equipment. They played the occasional interrupted residency at the aforementioned Cricketers round the back of the Oval cricket ground. The good news is…., is that the band recorded an album which was subsequently released after Alan's death. The album is still available on the NAIM record label at www.naim-audio.co.uk . The album is a fine example of the bands prowess and gives a fascinating reflection of Alan's fluid style and energy. From the most delicate melodies of "April showers" to the bombast of "6/8", the final track, each track demonstrates Alan's versatility and depth as a player. An absolute must for Murphy fans everywhere. In 1985 Alan recorded the first Go West album. This album was subsequently re-released as a double album titled "Bangs & Crashes" containing all the 12 inch mixes of the original plus an additional live track recorded at Hammersmith Odeon. Using a standard Fender Champ and a Squire Strat, these albums are arguably Alan's best work, complimenting effortlessly the soulful vocal talents of Peter Cox. Go West were successful world wide and as a result the band toured extensively, taking in Europe, the US, and the Far East. "One way steet" was used in the film "Rocky IV". A second Go West album "Dancing on the couch", saw Alan contributing to the writing on three tracks. Though not as successful commercially, still a fine and well produced album seeing Alan playing to his usual standard. Check out the lush "From Baltimore to Paris" from that album where the Murphy guitar lends a deft touch to the proceedings. Alan was enlisted to play on the one and only Kate Bush tour of the Europe & UK (1978). Both a live video and EP were released with material taken form this tour. Though Alan did not play on the first two Kate Bush albums, he did however contribute to the "Never for Ever" album, the highlight being a wild solo on "Violin". Alan's unique ability to extract the most amazing sonics out of his guitar was well suited to Kate Bushes graphic soundscapes. Alan was also featured on her next album "The Dreaming" released two years later. He also worked on "The hounds of love". One of the last sessions Alan ever recorded was "Rocket Man" for kate. In 1998 Alan was asked to replace Boon Gould and was to record the "Staring at the Sun" album with funk-pop superstars Level 42. This was followed by a round of touring. A live album was recorded during this period , "Live at Wembley". This was one of the last major projects that Alan worked on, as it was in October 19th 1989 that he passed away. 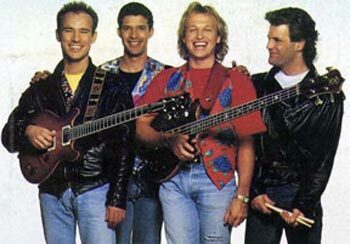 During the Level 42 period, a video was made called 'Fait Accompli' which featured an insight into life behind the scenes with the band. More info can be found at www.level42.com. In 2000 Polydor released a double album containing both albums. "Running in the family and "Staring at the Sun". Included are various remixes of tracks on the latter. Of particular note for Murphy aficionados would be the outro section on the "Tracie" remix with Murphy allowed to show what he can do. There are some nice touches on the extended mix of "Take care of yourself". "Heaven in my hands" demonstrates Murphy's rocking rhythm playing on what is possibly the albums best track. As pointed out earlier Alan was a much in-demand session man. There is a hefty list of artists for whom he worked, such as, Long John Baldry, Joan Armatrading, Mike and the Mechanics (including their hit single "The living Years"), Ami Stewart, Scritti Politti, So ("Horseshoe & the glove" great album), Miquel Brown and many others. Alan was not afraid to experiment with equipment. He rarely played a stock guitar. He was a Start man for the large part because he found them easy to experiment with and change bits and pieces. In the early days of his career he played a 335 before changing to Fenders. 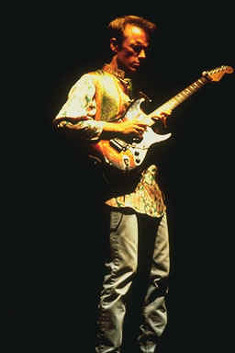 He played everything from butchered Squiers to custom made Strats made by Roger Giffin as well as Aria Esprit's. These guitars gave him his signature bell like rhythm guitar sound, typical of his playing in Go West. On his Squier he had a Kahler tremolo with a palm lever. His amplifiers were mainly Boogies and Fenders which he rewired regularly. He preferred to record with nothing more that a Fender Champ. Live, he used extensive rack equipment, preferring the cleaner sound to that of pedals, and power amps to boost the signal of the 10 watt champ. Alan constantly experimented with guitars, leads, amps and anything he could lay his hands on, and was a perfectionist to truly stunning effect. To those of us lucky enough to have heard Alan play in our life times, he was without doubt a very gifted geezer. A rare musician, bursting with that elusive X-factor. He has however left us with a considerable audio legacy. To the uninitiated, I strongly recommend that you get a grip and check him out. I would also recommend that you take a look at the Alan Murphy , site. Lest we forget! Alan Murphy : The Alan Murphy web site. Level 42 More info about Level 42 (and kind use of photographs). Naim-audio : Where you can get the SFX album.